Butter is one of the best real food fat sources out there. It has many health benefits AND it tastes amazing. Butter on fresh baked bread, anyone?? YUM! Unfortunately butter is one of the fats that is best if used only at lower temperatures. The low smoke point can cause free-radicals to form and that’s no good for our bodies. Plus there’s the lactose problem for some people. Fortunately, there is a way to work around these two issues. Make ghee. Have you heard of ghee?? Ghee is the amazingly delicious combination of browned butter and clarified butter. Let me explain. Butter is made up of three elements: butterfat, milk solids and water. Both lactose (the naturally occurring sugar) and milk proteins (the natural proteins made by the animal) are found in the milk solids portion. The amounts of both are relatively small in butter, but they’re there nonetheless. Those with extreme allergies or sensitivities will notice their presence. Removing the troublesome milk solids from the butterfat allows the allergy-prone to enjoy butter without the harsh after effects. The resulting substances are called clarified butter or ghee depending on your method. Note: If you have severe dairy allergies, you may want to avoid ghee until you consult your doctor to see if it is a safe alternative for you. Those with an intolerance should have no problem. 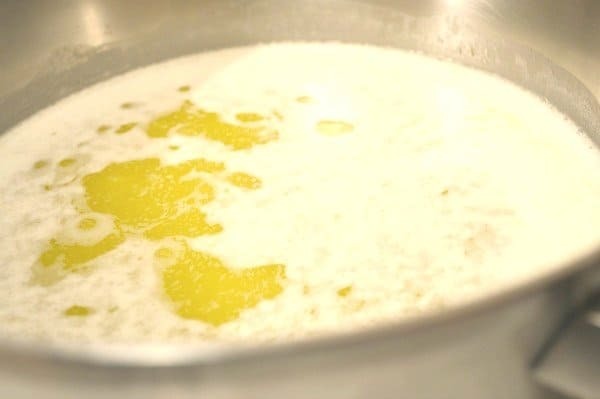 Clarified butter is made by heating butter on low until the water evaporates and the milk solids separate from the butterfat. 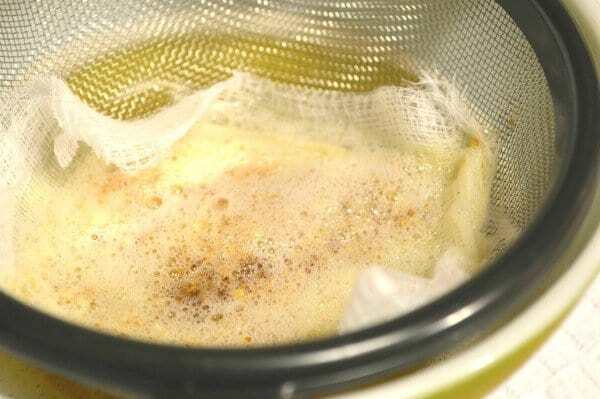 The milk solids can then be strained out leaving you with clarified butter. Leaving it safe for those with dairy intolerance. Clarified butter has another bonus besides being allergy friendly – it has a very high smoke point (approximately 485°F ). This means you can reach for clarified butter when you’re searing a thick steak or pan-frying potatoes (remember that similar to olive oil, butter has a lower smoke point and heating it increases the likelihood of creating free-radicals in our food!). 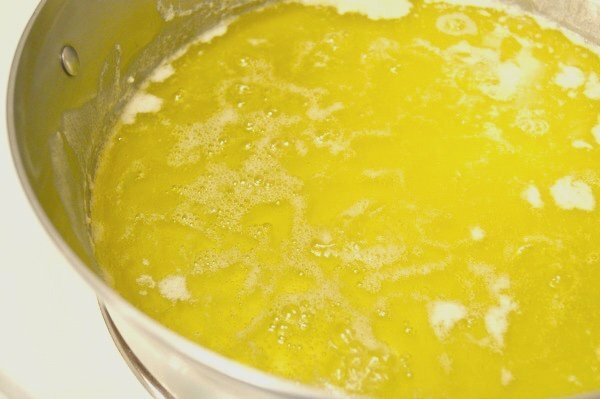 Clarified butter is excellent in Hollandaise (the one usually served over asparagus or eggs benedict) and Béarnaise sauces (traditionally for steak), or even for dipping lobster and crab. Since the flavor of butter will be intensified in clarified butter, it’s important to use a better quality butter from the start. Ghee and clarified butter are not the same but are closely related. To make ghee, you heat butter on medium-low until the water evaporates and the milk solids separate from the butterfat. But instead of straining at this point like clarified butter, you allow the milk solids to barely start to brown at the bottom of the pan. This gives the ghee a distinct nutty flavor that is oh so delicious! Once the milk fat browns, you strain it out and are left with ghee. Like clarified butter, ghee is allergy friendly and has a high smoke point. Making it safe for cooking at higher temperatures. My go-to for pan frying or roasting vegetables is coconut oil. But some people don’t like the taste of coconut oil for certain dishes. Ghee is a great alternative. Browned butter is the simpler version of ghee. For those that don’t have dairy allergy problems, but want the nutty flavor of ghee, you can make browned butter. 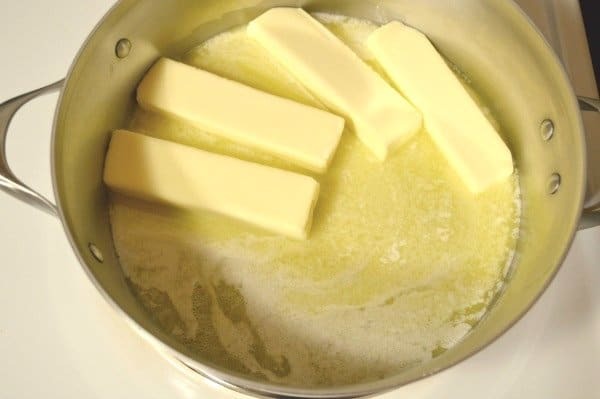 Heat your butter on medium-low and allow the milk solids to fully brown. (Keep an eye on it so it doesn’t burn!) Then skip the straining and just mix together. Since the milk solids are still in the browned butter, it will have a low smoke point. You won’t want to pan-fry your potatoes, but you can use it in baking. A little extra buttery flavor to molasses breakfast cookies or chocolate chip scones sounds great to me! Since ghee is the middle man of these three delicious butter variations, I’ll give you the tutorial. Start by heating your pan on medium-low. (Low for clarified butter.) Once your pan is hot add unsalted butter. Stir to help the butter melt faster, if desired. Once the butter melts, it will start to foam on top. These are the milk solids separating from the butter fat. Skim some of it off with a spoon as it heats. Allow the milk solids to brown on the bottom of the pan. Keep a close eye so they don’t burn. At this point, if you want browned butter, mix butter and milk solids together and remove from heat. Store in a glass jar. 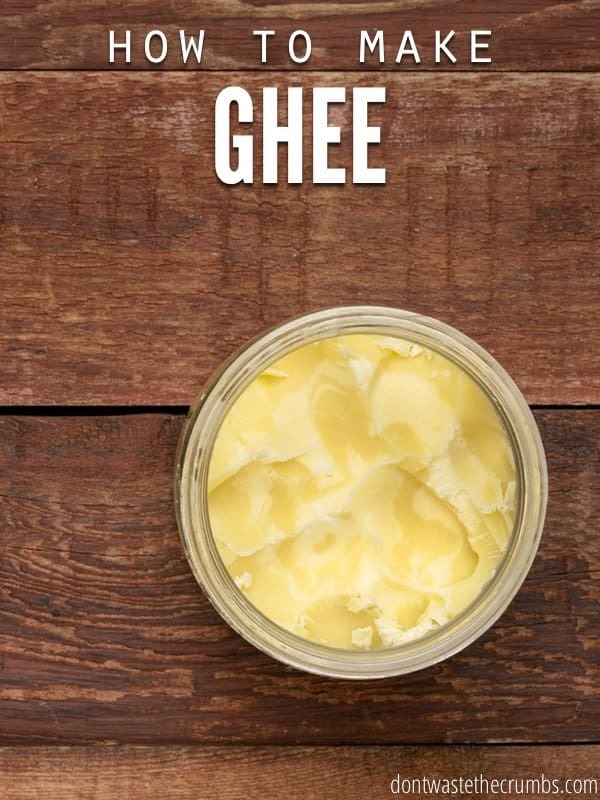 To make ghee, remove from heat and strain the butter fat from the browned milk solids. (I found cheesecloth and a strainer work well.) It should be lighter in color than browned butter, but slightly darker than clarified butter. Heat pan on medium-low. Add butter to pan once it is hot. Allow butter to melt and begin to foam. Remove some of the milk solids (foam) from the top. Allow to simmer until the butter becomes clear and the milk solids drop to the bottom. Keep a close eye on the butter as the milk solids brown, making sure they don't burn. Remove from heat and strain out milk solids. A stainless steel pan works better for this recipe than my trusty cast iron. It’s hard to see the brown milk solids on the cast iron! Ghee will be liquid at first, but turns into a soft solid as it cools. Store in a glass jar in the refrigerator. It melts quickly when using it to cook. Is making ghee worth it? I explored the idea of making butter before, which is not worth it for me. But what about ghee? I’m a big fan of coconut oil for high temperature cooking. And I don’t have any issues with dairy either. So making ghee isn’t high on my priority list. However, the process is very simple and easy. If I was out of coconut oil or had dairy issues in my family, I would put it on my must make from scratch list. Using this thought process of determining what is best to make from scratch is one of many principles I teach in Grocery Budget Bootcamp. This helps me keep costs down on groceries while also considering the value of my time. Do you use ghee for cooking? How do you like it? I do use ghee for all my cooking and baking pan “greasing.” I love it! It also adds a nice flavor to my lamb curry. Our son has been diagnosed with a severe lactose intolerance. I’d heard that clarified butter would work for him, but you’ve made it so easy to try. I’m on this! Thank you! This may be a silly question to you, but why don’t you want to cook with olive oil? What is the shelf life of clarified butter (if stored properly)? I have a severe lactose intolerance and I have been mourning the loss of butter in my backed goods. So, thank you for this! I was told if you store it in the fridge 6 months or at room temperature for 3 months.